Ten days after Captain Eric Pederson was accepted into the Naval Postgraduate School Center for Homeland Defense and Security master’s degree program a real-world lesson began developing for the North Dakota State Trooper. 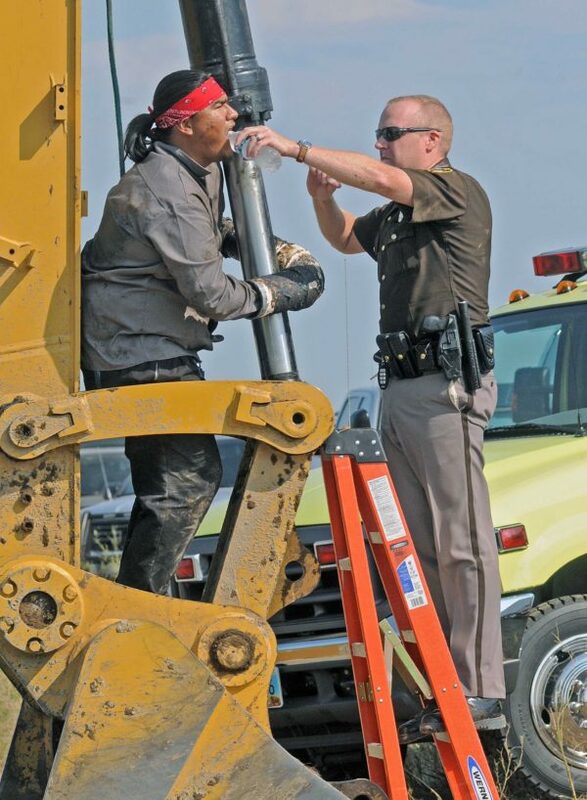 Master’s degree participant Eric Pederson, a North Dakota highway patrolman, offers Dale American Horse Jr. a drink of water during the Dakota Access Pipeline protests last winter. Native American tribes in the state were pushing back against the planned construction of the more than 2,000 mile-long Dakota Access Pipeline, intended to transport hundreds of thousands of gallons of crude oil daily to a storage facility in Illinois. The tribes, Standing Rock Sioux and Cheyenne River Sioux, feared a pipe malfunction could pollute their water supply. The protests had greatly expanded by November 2016 as groups as varied as Hollywood celebrities to grass-roots environmental activists joined. What began as a local situation – officers in North Dakota like Pederson have worked with tribes most of their careers – ballooned into a national, emotionally charged issue heightened against the backdrop of a divisive presidential election. While ostensibly about water, the protest also raised issues of private property rights, U.S. treaties with Native Americans, and historical inequities. A standoff of sorts ensued over 233 days. During that time Pederson worked everything from crowd control donned in riot gear to the Planning Chief at the State Emergency Operations Center. The State Patrol’s goal, he said, was ensuring safety on all sides of the debate as the crowds grew. The original protesters were joined by outside groups with varying agendas, and in some cases counter-protesters were an additional safety concern. Much of the discord stemmed from long-time tensions between Native Americans and the federal government, which the state could not remedy. The protest camps were successfully cleared in February 2017. A multi-agency response is critical. Newly elected Governor Doug Burgum employed an “All of Government” approach that enlisted multiple departments, which allowed for better coordination and resource utilization. Social media can be a double-edged tool. It allowed for fake news that heightened tensions in the protest camps. On the other hand, the state was able to utilize social for intelligence, allocating resources, and ensuring accurate information was distributed. Communication is key. During the entire time, state officials maintained communication with members of local tribes and camp leaders. “Our unified command did a good job of keeping those lines of communication open,” Pederson said. Using the Emergency Management Assistance Compact (EMAC) also proved critical. Crowd size was estimated at 8,000 in the protest camps, a significant number of people for a state of North Dakota’s population. “Our EMAC partners were critical. We couldn’t have done it without them,” Pederson said. His role enabled Pederson to put into practice his CHDS studies in near real-time. He cited the Intelligence for Homeland Security and Unconventional Threats to Homeland Security as being especially helpful. And the techniques used during the operation mirrored those in the Technology for Homeland Security class, specifically the use of drones and streaming webcam.